As we start a new school year (my baby girl is going to first grade!! ), I'm all about planning quick and easy meals that are delicious and healthy. If I can do some prep ahead, even better. And if it gives me leftovers for lunch the next day, it is perfect in my opinion! 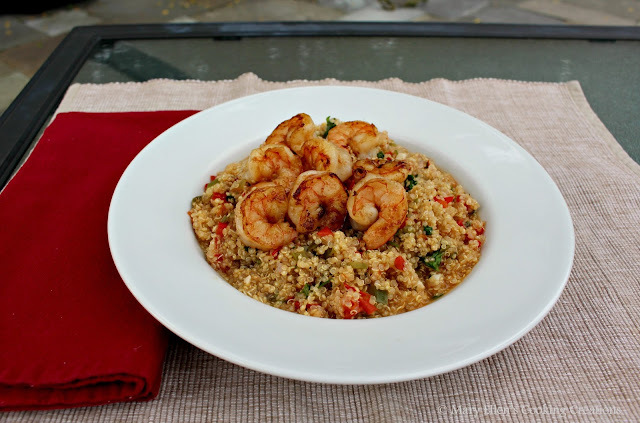 This meal has so many things going for it - it is healthy, quick, full of flavor, some of it can be prepped ahead of time, and the quinoa makes great leftovers both hot or cold. 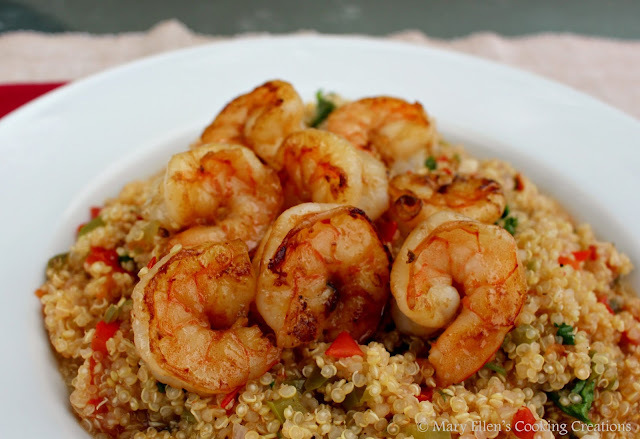 You could also eat the shrimp on its own with some grilled veggies, or you could eat the quinoa on its own or with some other protein, like grilled chicken. Oh, and did I mention it is delicious? Shrimp is something you can grill or pan fry in less than 10 minutes so I always have a bag of frozen shrimp in my freezer for quick meals. I'll watch for when the store has the 2lb bags of 21-25 or 26-30 count shrimp on sale for $9.99 - you really can't beat that deal. For this dish I wanted the shrimp to be sweet, sticky and bright. Using sweet hoisin sauce and zesty lime along with a bunch of garlic gave me exactly that. 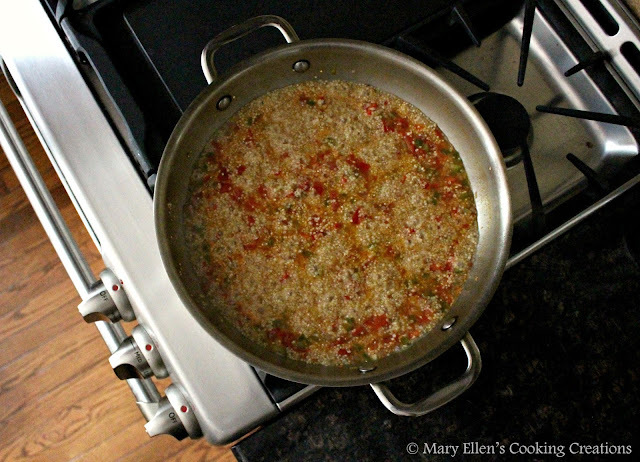 To balance out the sweetness of the shrimp, I made a spicy quinoa with jalapenos, tomatoes, peppers, cilantro and lime, and to keep it easy I did all of my chopping ahead of time. 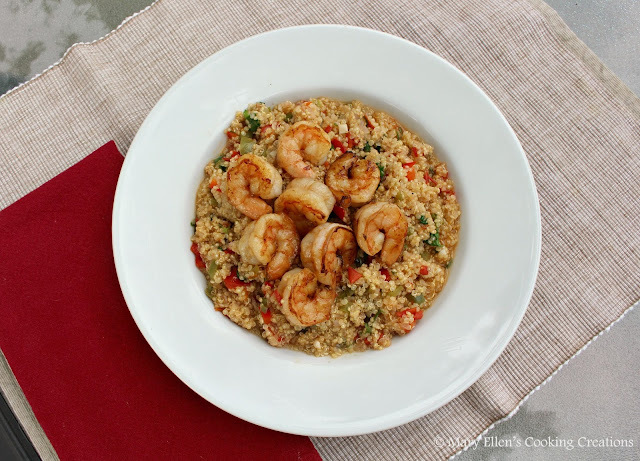 We were so happy with the flavors in this, and the shrimp and quinoa worked so well together. As far as timing goes, start your quinoa right away. Once it gets simmering for several minutes you can start your shrimp and everything will finish at the same time. Mix the hoisin, lime juice, red pepper flakes and garlic. Pour over the shrimp and marinate 30 minutes to 2 hours. Heat the oil in a stainless saute pan. Remove the shrimp from the marinade and season lightly with salt and pepper. Saute the shrimp approximately 6 minutes until cooked through. Add the broth and simmer, covered, approximately 10 minutes. Remove the lid and simmer another 3-5 minutes until the quinoa is cooked (mostly tender with some bite) and most of the liquid has absorbed. Stir in the cilantro and lime juice and season with salt and pepper to taste. This looks so good! 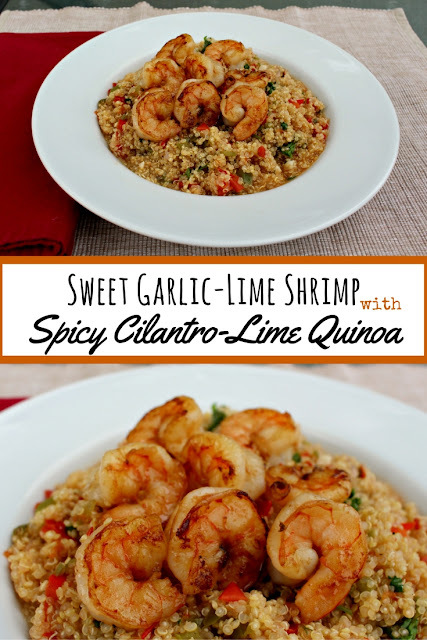 It's like shrimp scampi with a kick! I love that you use quinoa instead of rice.